Home › (GM) General Musings › MLB › Player Spotlight: Who is Alex Jackson? Would you get excited about a scouting report like that? I definitely would, and so did the Seattle Mariners, who drafted 19 year-old Alex Jackson as the 6th overall draft pick of the 2014 June amateur draft. Many first round draft picks end up beings busts, but I see big things for Jackson, who has a high ceiling as either a catcher or an outfielder. According to OOTP15, Alex is the #2 overall prospect in baseball, ahead of Carlos Correa, Kris Bryant, Miguel Sano and Corey Seager. Baseball Prospectus’ Mark Anderson also sees Jackson as a potential “beast” (chat excerpts are shown below). In a simulated season, we see improvement in almost all categories, and only a slight decrease in overall potential. 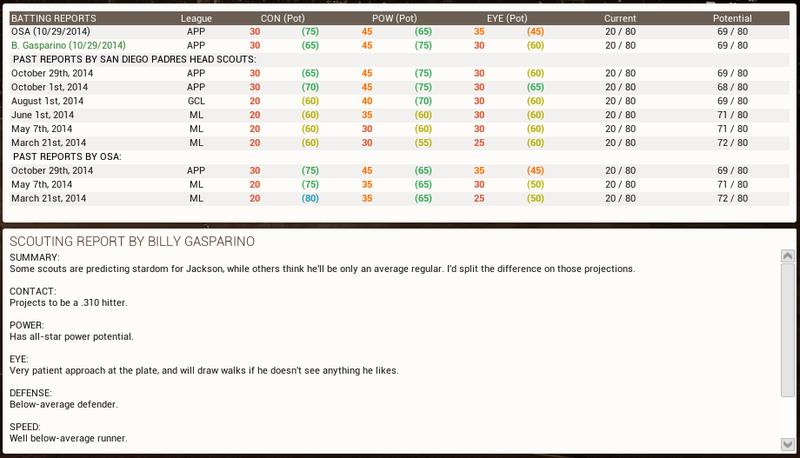 Check out the POTENTIAL 162 game season based off of his 55 games played in the Rookie League of OOTP15. 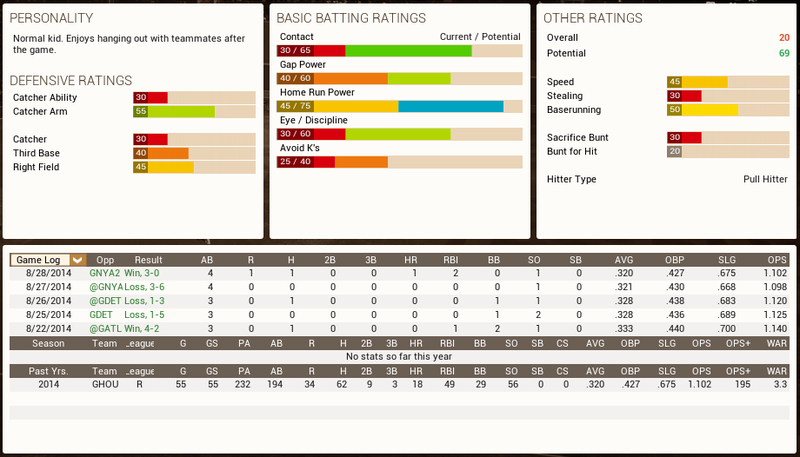 53 HRs, 144 RBIs, .320 AVG. and a 10.0 WAR. That sounds like a triple crown season to me (yes I know that’s extremely optimistic, but still, the potential is there). Even his defensive ratings aren’t too shabby, especially when you consider the strength of his arm. But an interview with Baseball Prospectus’ Daron Sutton gives me even more reason to be hopeful. The below answers sound a lot like a young Derek Jeter, one of, if not the ultimate example of classy competitor. If I were the GM of the Mariners, I would hang on to Alex Jackson for the long haul. “My mom sets an amazing example for me. The way she goes and she does her thing and makes sure that I have everything I need. She’s always there to support me and has my back on everything and it’s definitely a great feeling,” Jackson said in 2013.
Who do you think becomes the better MLB player? Kyle Schwarber or Alex Jackson? Of the young hitters in the low minors, who has the highest ceiling? Are there any “franchise” type players with elite ceilings? ‹ (GM) General Musings: Cole Hamels to the Yankees?